SUMMARY: A good example of the application of RubberBond Fleeceback EPDM in a high humidity installation. Rowsham Dell is a 20 year old privately owned property in Milton Keynes which required a roof for a new swimming pool extension. For a domestic property, the roof extension area is was large at 120m² and included parapets and a roofing lantern in the centre. The roofing contractor, Bailey Roofing, was looking for a robust roof covering that was suitable for a high-humidity environment. They required an airtight waterproof installation, with guarantees of longevity and technical support if required. 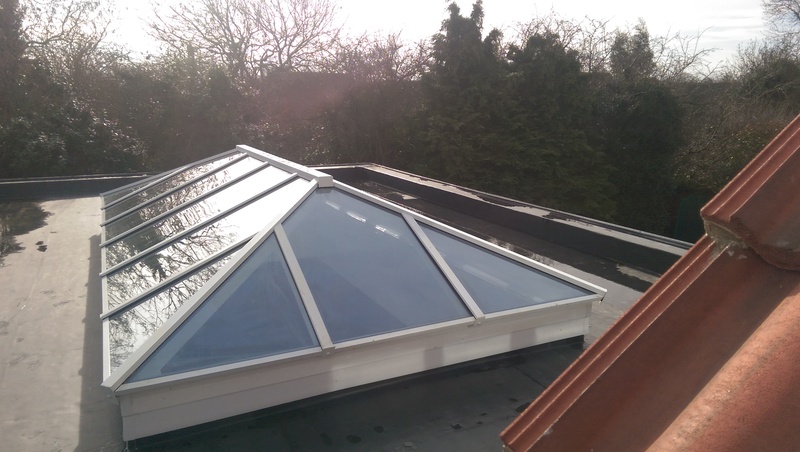 The extension roof required a waterproof covering to create an internally sealed construction due to the high humidity levels and to ensure the air recycling system worked efficiently. RubberBond EPDM was chosen as the preferred roof covering due its exceptional waterproofing capabilities and flexibility. In addition, its contemporary appearance was in keeping with the rest of the property. The roof construction consisted of an OSB3 deck with Alutrix Vapour Barrier, tapered insulation with tissue facing and RubberBond EPDM. RubberBond was perfect as a single ply EPDM application for this project because the FleeceBack negated the requirement for base tie-in’s to the abutments, which are required by the majority of single ply membranes. This avoided the need to puncture the vapour barrier, meaning its effectiveness would not be compromised. 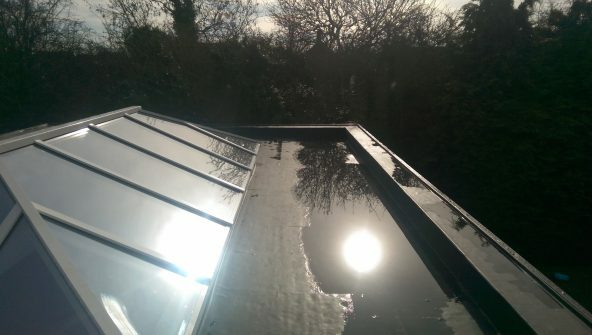 RubberBond EPDM ensured an air tight waterproof solution for the roof. Bailey Roofing has worked with RubberBond EPDM for over a decade, installing tens of thousands of metres with zero product faults. This has given them total confidence in quality; along with the knowledge that their teams could install reliably, quickly, and within the timescales required. Bailey Roofing was able to take advantage of the technical support offered by Flex-R, who is the sole distributor of RubberBond in the UK. Flex-R’s product experts attended planning and sign off meetings and provided ongoing on-site installation assistance. Flex-R’s technical support gave Bailey Roofing total peace of mind throughout the project. This RubberBond FleeceBack EPDM roof installation will ensure that the swimming pool roof will last for many years. RubberBond has BBA Certification stating under normal service conditions, the system will provide a durable waterproof covering with a service life of at least 35 years. The system is UV stable and does not suffer from cracking or crazing over time and there are no plasticisers that can migrate, ensuring it remains flexible over its service life. The roof will change little in appearance over its lifespan, ensuring the homeowner retains the look that they were trying to achieve originally. Flex-R’s technical support ensured that the project was completed on time and in budget. The swimming pool extension has a practical and aesthetically pleasing roof, robust enough to perform over a challenging environment, protecting the homeowner’s investment for years to come.